Any city that uses the term Paris to describe itself has large shoes to fill if it is to be convincing on all the levels of Parisian culture, ambience and beauty. Buenos Aires is known as the ‘Paris of the South’, not flippantly by any stretch, and while many will argue that it’s nowhere near as beautiful as the French capital, it certainly has rich cultural and architectural heritage, while being more European than South American in ambience. 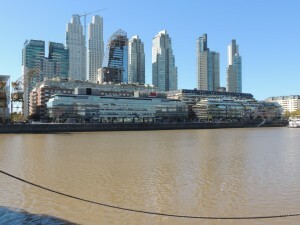 Argentina’s capital is an immigrant city, mostly Spanish and Italian but also from the neighbouring countries of Bolivia, Paraguay, Chile and Peru. 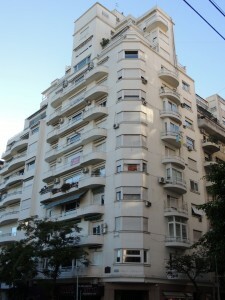 The southern neighbourhoods of La Boca and San Telmo were the original populated areas but an outbreak of yellow fever pushed the wealthy north into Recoleta and Palermo in the early 19th century where they commissioned their Italian architects to build their new palaces, many of which are now embassies and historical sites. 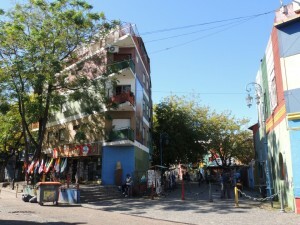 La Boca became a working class area and the locals occupied the large houses left by the wealthy to form conventillos – communal dwellings with many people sharing bathrooms, kitchens and communal spaces. Boca is considered the birthplace of the Tango and has become a tourist hotspot for people to see how the population of this city started out and of course to visit the Mecca of Argentinian football, La Bombonera, home to the Boca Juniors where Diego Maradona plied his trade. San Telmo plays host to the Sunday antique market centred in the main square with street vendors, artists and performers adding to the bohemian atmosphere in this historical part of town. By the evening, restaurants, bars and street cafes surrounding the square come to life with impromptu Tango performances dominating the street vibe. 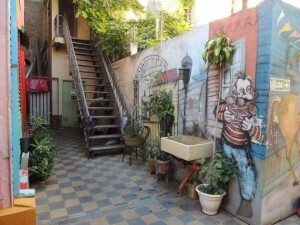 Part of the old city of Buenos Aires was the dockland area on the banks of the Rio de la Plata that became derelict and a haven for the homeless and the drug trade. 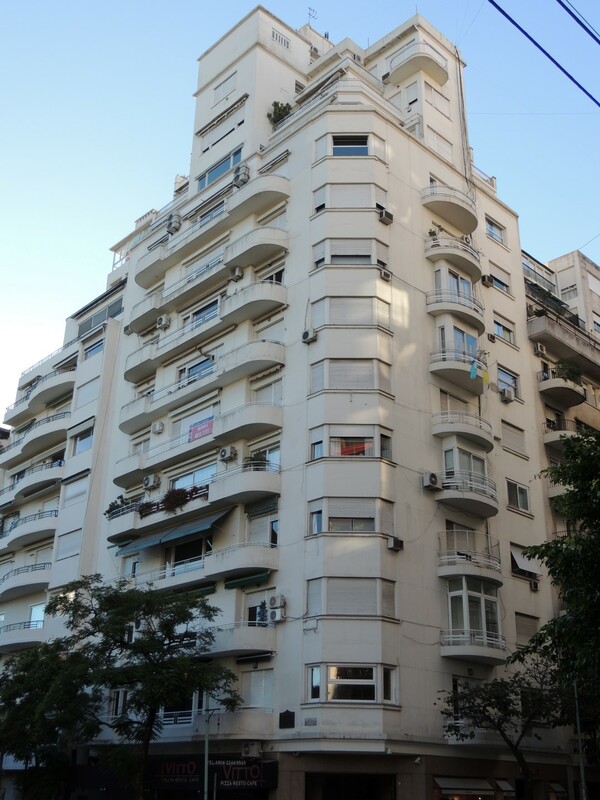 In 1988 an urban regeneration project began to bring residents of the city – Porteños – back here to live and play and extend the living area of Buenos Aires by 175 hectares. 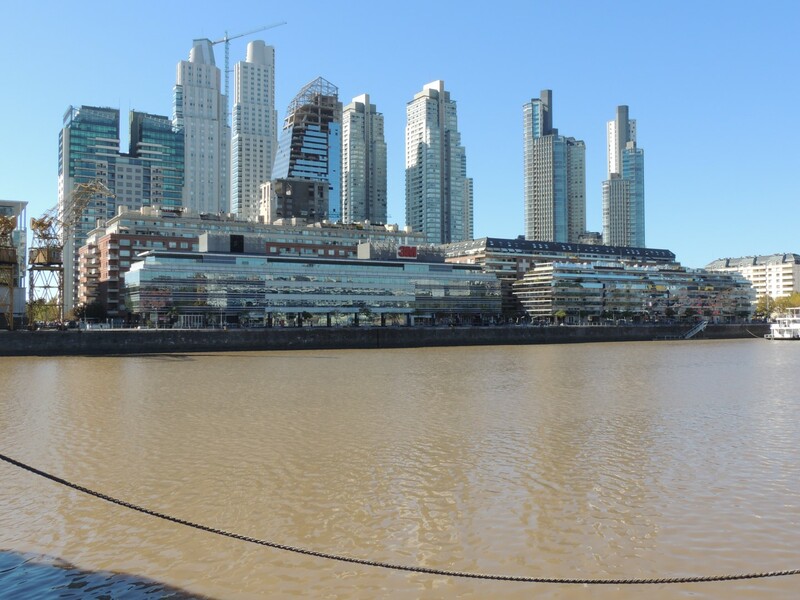 Puerto Madero is the city’s new waterfront and is fast becoming the fashionable district with trendy bars and restaurants in a setting of wide avenues, restored buildings and some of the hottest new real estate in town. 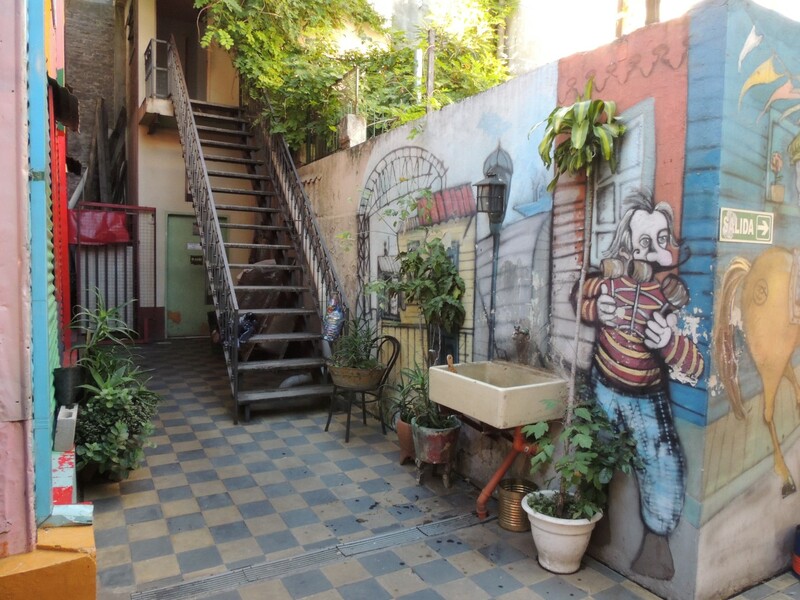 This neighbourhood is dedicated to Argentinian women so all street names celebrate those women who made a difference in the country’s heritage and culture. 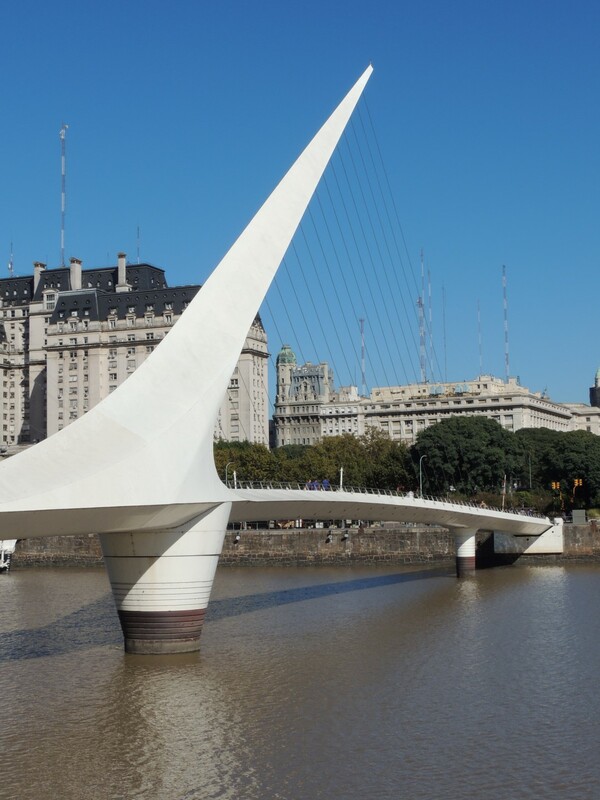 The centrepiece in its design heritage is architect Santiage Calatrava’s Puente de la Mujer (Women’s Bridge), designed to reflect the close embrace of the tango as a bridge between the new and old of this sensual city. 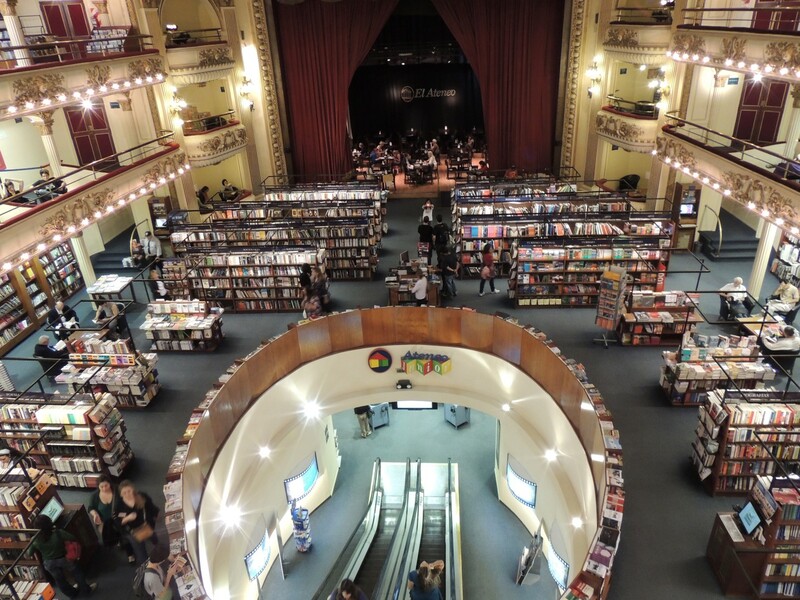 One of the world’s top five book fairs, the Buenos Aires International Book Fair, is held every April and a short walk across the bridge and into the city is a bookshop listed in the top ten in the world. 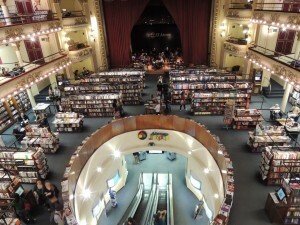 The old Teatro Gran Splendid, originating from the early 20th century has been transformed into El Ateneo Gran Spledid, a marvel of book retailing where literature and music are presented within the restored theatre auditorium and private box suites. Two dates hold great importance in Argentina and both are given great importance in Buenos Aires. The May Revolution which started on the 10th of May in 1810 gave rise to the county’s independence on 9 July 1816. The latter gives its name to one of the widest streets in the world, Avenue 9 de Julio, and the former, Plaza de Mayo to the main square in front of the Pink House (Casa Rosada), where Eva Perón gave her famous speech to the people in 1951. The “Spiritual Leader of the Nation” died in 1952 age 33 and her final resting place is in the Recoleta cemetery where she’s buried in her maiden name of Duarte’s mausoleum. The cemetery is a must visit for its elaborate tombs and insight into Argentina’s and Buenos Aires’s social, political and religious figures. 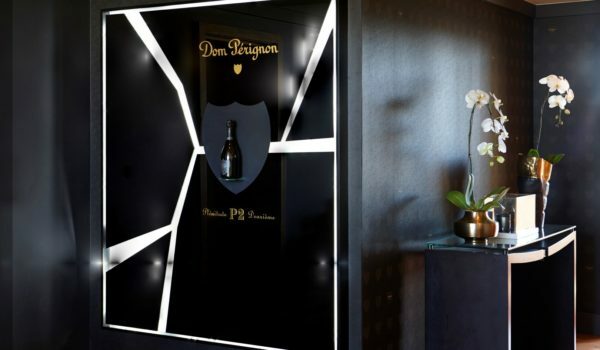 It is centred between the suburbs of Palermo and Recoleta where the old money of Buenos Aires resides and where the luxury boutiques and old-school street cafes that gave the name Paris of the South to this cosmopolitan city. There are no longer direct flights into Ezeiza airport from South Africa, so your travel options are either SAA to São Paulo and then Aerolineas, Argentina’s national airline, into the capital, or Emirates Airlines via Dubai. An Argentine Peso will cost you about R1.30 and prices are high with rampant inflation. 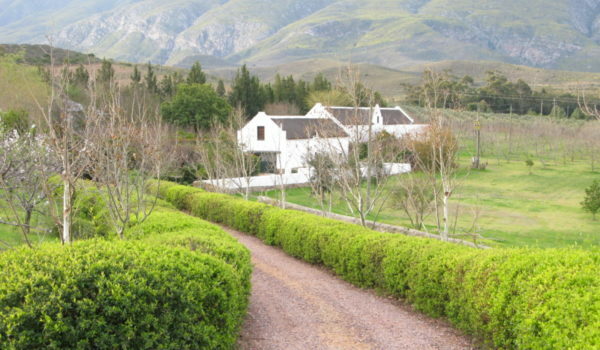 No tourist or business visa is required for a stay of up to 90 days and passports must be valid for a further 90 days after your departure date from Argentina. Close to Recoleta and Palermo is the Floralis Generica sculpture in United Nations Square flanked by the national Museum of Fine Arts and the university law school. Architect Eduardo Catalano designed the flower to open at sunrise and close at sunset.